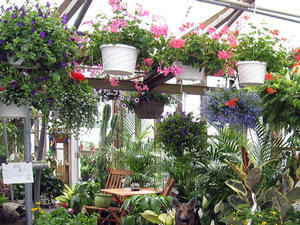 Flowering hanging baskets provide long-lasting beauty both indoors and out. Brighten up a porch, patio or deck. Create a hanging garden under your favorite tree. Or, create your own little oasis in your sunroom. They also make great gifts! Small pots dry out faster, but very large baskets with more soil may become too heavy to handle. 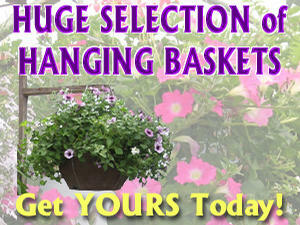 A 14-inch diameter, deep hanging basket is a good place to start until you get a feel for what you like. Baskets come in a variety of materials. Plastic retains moisture well, is inexpensive and easy to find. Coco-fiber/moss baskets are more decorative but dry out faster and liners need to be replaced periodically. Ceramic pots are similar to plastic and can be more decorative, but they also add weight to your basket. Wood and terra cotta dry out faster than plastic, but not as quickly as a fiber-lined basket. Choose plants that fit your environment and lifestyle. Will your baskets be hanging in sun or shade? Do you have enough time to meet your plants’ water needs? Do they require deadheading? How much fertilizer will be needed? 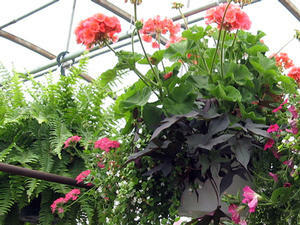 How much time you have to devote to your hanging flower garden should help determine the plants you get. 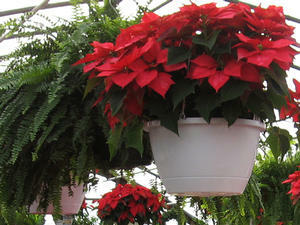 Use a good, light potting soil and replace the soil in your baskets every year. There are several good commercial mixes available – some even come with fertilizer. Strike a happy medium between “too wet” and “too dry.” In cooler weather, you may need to water less frequently. As plants grow bigger and summer heat arrives, prepare to water as much as once a day (maybe even twice a day, depending on the plant and where you live). Windy days tend to dry the soil out faster, as well. 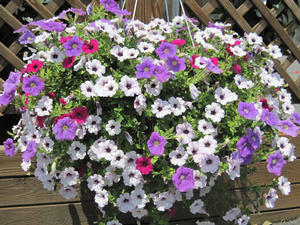 Add a slow or controlled-release fertilizer to your hanging basket right after you buy or plant it. By midsummer, you can start using a water-soluble fertilizer once a week. If your plants are exposed to heavy rains, you may want to give them a dose of water-soluble fertilizer after the rain stops, as much of the existing fertilizer may have gotten washed out with the rain. 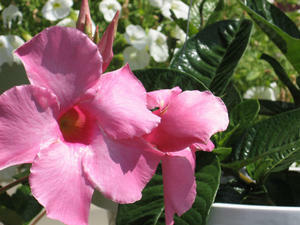 Some plants may need deadheading or even a midsummer “haircut”. 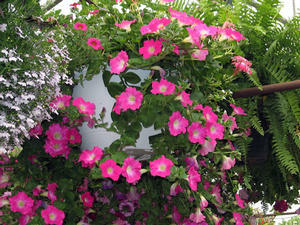 Hanging baskets that have become spindly and ungainly over time can benefit from a trim. Using sharp scissors or clippers, trim an inch or more off the entire basket. If you have long trailing pieces that you don't like, cut them off. You may be temporarily robbed of flowers, but trimming the plant will help it branch out and look better long-term. And, the flowers should return within a few days to a week and, given enough fertilizer, your plant is likely to start growing more strongly again. 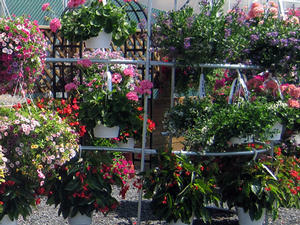 Information for this care sheet was supplied, in part, by Proven Winners® at www.provenwinners.com, “Hope for Hanging Baskets” by Kerry Meyer. 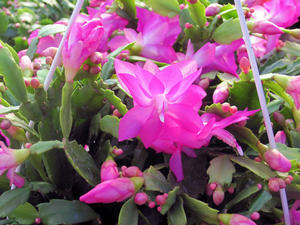 Milmont Garden Center is pleased to offer a variety of Proven Winners plants.